A Russian airliner crashed in Egypt's central Sinai Saturday, killing all 217 passengers and seven crew members, with the reasons behind the crash yet to be determined. The plane, whose passengers were mainly Russian tourists, lost contact with radar at 6.20am CLT (Cairo local time), less than half an hour after takeoff. It was flying at an altitude of 30,000 feet. Reuters quoted an anonymous officer on the scene as saying that "the plane split into two, a small part on the tail end that burned and a larger part that crashed into a rockface." An aviation team has retrieved the black boxes of the plane in order to determine the reason behind the crash of the Airbus A-321, which was heading from the Red Sea resort of Sharm El-Sheikh to Russia's St Petersburg. German carrier Lufthansa and Air France-KLM, two of Europe's largest airlines, have decided to avoid flying over the Sinai Peninsula while they wait for clarity on what caused the airliner to crash. Spokeswomen for the carriers said the decision was made for safety reasons. "We took the decision to avoid the area because the situation and the reasons for the crash were not clear," a Lufthansa spokeswoman told Reuters. "We will continue to avoid the area until it is clear what caused the crash." Egyptian officials released contradictory statements on what happened during the minutes leading up to the incident. Civil Aviation Minister Hossam Kamel told a press conference in Cairo that communication between the Russian plane and air traffic control seemed completely normal prior to the crash. "The crew didn't even send an SOS and suddenly the plane disappeared off the radar," Kamel said. Earlier during the day, however, Ayman El-Mokadem, who is heading a government committee to determine the cause of the crash, said that the pilot sensed a technical failure and reported it to air traffic controllers, requesting to land at the nearest airport. El-Mokadem added that the plane seems to have crashed during the attempt to shift directions in order to land at Al-Arish Airport in North Sinai. The northern part of the mountainous Sinai Peninsula has been the epicentre of an Islamist insurgency that spiked following the 2013 ouster of Islamist president Mohamed Morsi. Egypt President Abdel-Fattah El-Sisi had announced on Wednesday that a state of emergency has been extended for a further three months in parts of North Sinai. Egypt's Prime Minister Sherif Ismail told the same conference that the black boxes will arrive in Cairo Saturday evening, saying that "We cannot know what exactly happened to the plane before we first listen to the black box recordings." El-Sisi has spoken on the phone with his Russian counterpart Vladimir Putin to discuss the crash, the Kremlin said in a statement. Offering deep condolences, the Egyptian president promised to create conditions for the widest possible participation of Russian specialists in the investigation into the cause of the crash, the statement added. Egypt's general prosecution has agreed to cooperate with representatives of the Russian government while investigating the incident. "A team of experts from the Russian government and from the company which manufactured the plane will arrive in Cairo on Saturday evening to join the investigation team," Ismail said. Russia's emergencies ministry has sent five of its planes to the site of the crash, according to the Russian embassy in Egypt. Russia's top investigative committee, meanwhile, has launched a case against airline Kogalymavia under an article regulating "violation of rules of flights and preparations for them," Russian news agencies said, citing the committee's spokesman. The Russian investigative committee said it was checking fuel samples from the airliner's last re-fueling stop in the Russian city of Samara, RIA news agency reported, citing spokesman Vladimir Markin. Markin also said that investigators are questioning the airport workers involved in preparing the aircraft and its crew, and carrying out searches at Moscow's Domodedovo Airport where the airline that operated the plane is based. Putin has expressed his deepest condolences to the families of the victims. He also declared Sunday 1 November a national day of mourning. Egypt's presidency has extended its condolences to Russia. 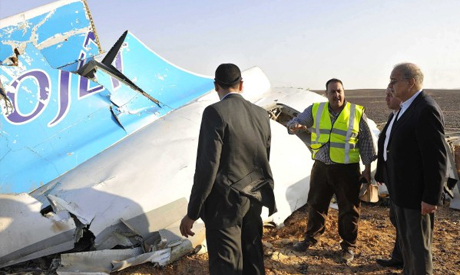 A total of 214 passengers were Russian, while three passengers were Ukrainian, an Egyptian cabinet statement read. An Egyptian search and rescue team were dispatched after the crash to search for survivors, but the Russian embassy in Egypt has said that no passengers survived. Reuters also reported that there were no survivors among the passengers or the crew. Bodies were reportedly found strapped to their seats inside the crashed plane. Seventeen children and teenagers, aged from two to 17, were among the passengers on the Russian jet, Russia's RIA news agency quoted a source in the Russian aviation authority as saying. Military planes have transported some of the bodies of the victims to Cairo, a medical source told Al-Ahram Arabic news website. Other bodies were sent to a Suez hospital, a medical source told the same site. Egyptian premier Ismail announced that 129 dead bodies have been recovered so far from the crash site and transported to Zeinhom morgue in Cairo. At least 50 ambulances were dispatched to the crash site, an Egyptian cabinet statement said. Ismail along with other ministers had headed to Sinai in the afternoon to monitor the latest rescue efforts before flying back to Cairo. Our dear Russian friends, We The People, of the USA mourn for your losses. Please know our hearts are heavy with sadness. Perhaps once the cause is known by Russian Officials, this will lead to improving the systems leading to this tragedy. Please know we care for you, we care about you, may you find Peace. Our prayers are for the victims and their families. Our next prayers are for Egypt; we hope this is an accident and not terrorism, as sad as it is. The Egyptian Tourism Sector has suffered enough for reason both beyond and under the control of the Egyptian Government. This is not the time to beat a dead horse, let’s hope for a graceful outcome for Egyptian Tourism. Condolences to our Russian friends. This was fitting reply by nature. Quoting the Bible is fine, your statement is inappropriate Truth. Empathy is the universal language. Our heartfelt sympathies to the families. Their loss has no depth and the pain in their heart is immeasurable. Tragedies speak a universal language and touch us all. A tragic and sad day for all - let us hope for strength to the families that lost loved ones. Looks like nature keeps track of every thing. Amen to that brother! Just out of curiosity who would give a negative vote for these beautiful words? !